Well, 2010 has started in the heat of the spotlight. The W’sFDB was the focus of the Spectro Oils booth at the annual Indy Motorsports Dealer Show. The best part was everybody from Milwaukee, as well as the engine team from Joplin, got to attend the show! The MX bike was an absolute hit and was featured in a little blurb in the daily show program. Everybody that stopped by the booth had a KX5 story to share. The bike even brought dirt bike stories out of John Penton, Malcolm Smith, Danny Eslick and Tom Morgan. It was a great way to start the year and keep the momentum growing! Stewart made great use of his first ‘vacation’ day since Shep was a pup, Kevin is ready for streamlined bodywork, and Mark can taste 130+ on the MX bike! With the MX bike on the southern leg of its victory tour, the lowered bike got a chance to run in October…with the old seat, no front fairing and Mark driving. It was supposed to be a great chance to shake out the new Digatron data acquisition system and try running an aftermarket pipe and carb set. It turned out to be sort of a rough weekend. While we have come to expect rain, two days worth of headwinds were something new and kept our speeds below May’s 125 + record run. We kept at it though and scored enough points for Mark to finish sixth in the ECTA Motorcycle Season Championship. It was the same all weekend. Track, impound, fuel trailer, return to the pre-stage line….do not stop at the pit. The Digatron worked great. It is really cool to watch the exhaust temp out of the corner of one eye, while following the white line with the other! It also keeps the riders from telling motor stories to Stewart! The zebra paint scheme started with DoldGuy at KXRiders.com. He helped out the cause with our fourth KX5 frame and when it came out of the UPS box it was spray bombed white. So we let loose with two more rattle cans and added a few stripes. Video of the action from the 2009 summer season is on it’s way. Remember…if you can’t catch um, you can’t stop um! 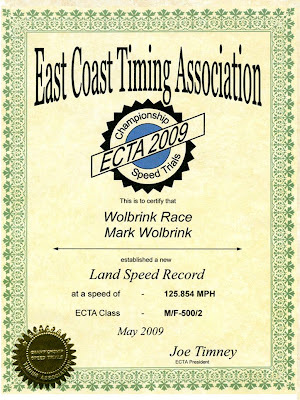 ECTA Certificate for the W'sFDB! 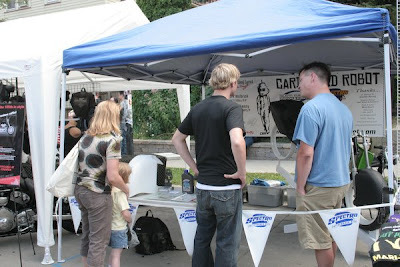 Here are a couple of photos from the May 2009 event at Maxton, NC. A detailed race report from the weekend can be found at the Two Stroke Motocross webpage. We are all really stoked that with everyone's help we got a stock MX bike to run down the track at nearly 126 mph with Mark on it's back! 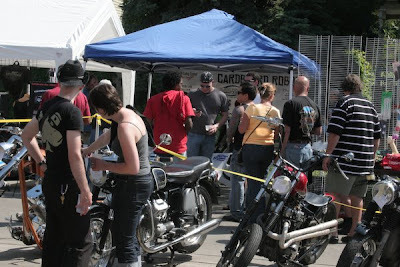 We defined stock like Rod Bush did...stock pipe & carb, different gearing and tires. 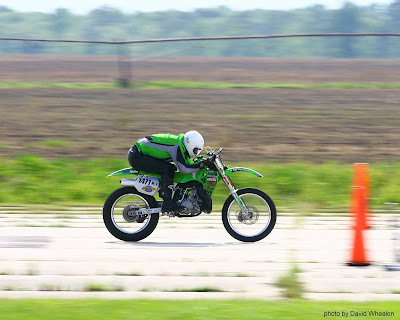 According to the ECTA, the new world record speed for a stock MX bike is 125.854 mph. This was also fast enough to set an East Coast Speed record for 500cc motorcycles running in the modified frame class burning fuel. The official time slip is thumb tacked over the copy of the original KTM article hanging in the shop. It always seems to rain at this place and this weekend's air was swampy at best. It made jetting a bit more difficult, but the Spectro Oil pre-mix and VP Fuel held up their end of the 'go' equation. Once again Stewart's engine pulled strong run after run after run. Believe it or not, Mark was excited enough about the weekend's results to drive 95% of the way home. The time slip was jammed in the dash and the rear view mirror was focused on the Spectro Oils / Cardboard Robot KX500..... the World's Fastest Dirt Bike! Performance Oils for Powersports !!! We are very excited that Spectro Oils is a team member again in 2009. They offer a superior product that proves it's true worth run after run on the salt !!! .....it says 131.431 m.p.h., but Kevin saw 132.444 m.p.h. on the down run. We had a chance to show the #3500 bike at Glenn Curtiss Motorsports.....there even was a live band. February in Wisconsin and everybody is more than ready to start summer. Dedicated to defending the right to ride two-strokes!! Here is a bit more about the World's Fastest Dirt Bike. the World's Fastest Dirt Bike! Kevin's first run was much faster than the old record of 121ish, but it took us the rest of the event to better what the guys from F2 Racing had run early in the week. By Friday, we were within 0.003 m.p.h. of their 130.674 m.p.h. best average. Pat and Tara would grab the timeslips and I was doing the math in the van on the way to impound. Double check the long division, swear out loud and then send Kevin back to the pits. It was like failing one pop quiz after another in math class. Just before noon on Saturday, Kevin ran another qualifing down run. The course was shutting down early, prior to the evening's award banquet, but we had one more chance to return for the record. Pat and I tried to cool off the bike and let everyone else in line run ahead of us. When it was our turn, Kevin took off down the salt. After listening to a week's worth of what we had been sure were record runs, it didn't sound good. Turns out, Kevin also had his doubts about the run. He really wound out fourth gear and tried to find new ways to get even smaller on the bike. After falling short by a few thousandths, we were now three quarters of a mile an hour faster than the F2 Racing bike's average! This is as close as we got to a photo of Stewart on the salt. Except for a few calls from me trying to describe plug colors, the only reason we were calling was to report speed updates. The motor he built ran flawlessly. He can fix most anything and makes everything faster, but he really loves the two stroke KX500 motor. Stewart's Dad, Dave, Arnie, Robert and the rest of the team in Joplin were a huge part of the reason we had as much success this year at Bonneville. I am proud that he can add the World's Fastest Dirt Bike to his resume! If you are interested in having the second fastest KX motor in the world or just the meanest trail bike in the neighborhood, give Stewart a call 417.623.1088. AMA 500cc M/P National Record Bike ! Well, the official math worked out and with a two way average of 123.411 m.p.h. 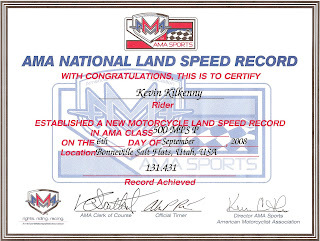 the #1471 bike set the AMA 500cc Modified Frame / Production Engine National Bike Record! After Kevin beat the MPS record on Saturday, we removed all of the 'streamlining' in front of the rider, adjusted the levers and ran through tech one more time. After all the work to swap from the full height motocross bike to the lowered and faired MPS bike this was super easy! We even had time to pose for a few 'sponsor thank you' photos before the sun went down. Early Sunday morning we rejetted, got the duct tape race numbers on the seat, and even noticed there was a bit of a tailwind for the down run. The run felt really great and the time slip read 127.718 m.p.h. The return run felt just as good, but the effect of the wind was obvious and the time slip was parked at 119.306 m.p.h. Here is a link to a page from a guy named Scooter Grubb, nevermind his name. He is putting together an annual scrap book about the BUB event and donating a chunk of the profits to the Save the Salt fund! I don't know much about the 90 m.p.h. bike, but we will happily claim the 117. On Wednesday morning, I ran a 117.529 m.p.h. on the #471 Production Frame / Production Engine bike. Picture a full size MX bike fresh from the dealer's showroom. You can see is run in this video. Then we tore the bike apart, put on the slippery bodywork and let Kevin ride it. On his very first run the timeslip read 123.729 m.p.h. We had basically shown up, unloaded the bike, ran it once down the track and already had two miles an hour on the old record! This might be an easier way to keep up with the newest videos. Just a quick post to let everyone know we made it home! Nothing is official yet, but we had a few good runs and a lot of fun! 3 Sep 2008 11:06am 500cc P/P Down Run at 117.529 mph. 6 Sep 2008 11:53am 500cc MPS/P Return Run at 132.44 mph. 7 Sep 2008 9:46am 500cc M/P Down Run at 127.718 mph. It was a great team effort! A few weeks ago, Tara and I had the chance to see another team's attempt at a speed record at the annual EAA convention in Oshkosh. On July 30, the Nemises NXT posted a 356 mph run on a 331 mph C1-b record. We met Jon and Patricia Sharp a couple of years ago and immediately became excited about what they were doing. It seems they have the perfect partnership, she builds what he designs! It is obvious that both have an equal stake. After the record run was certified, everyone was smiles and there was a reason to pose for the camera. I wanted to be sure to take a minute and thank those that are helping out in 2008. These are the people that believe in us and we are proud to be associated with them! We are individuals, not members of any racing extablishment. 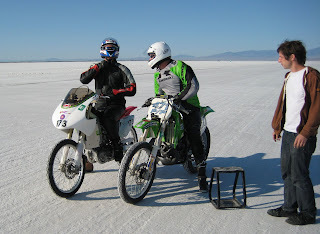 At Bonneville, we get to stand on the same salt and compete against the best land speed teams. 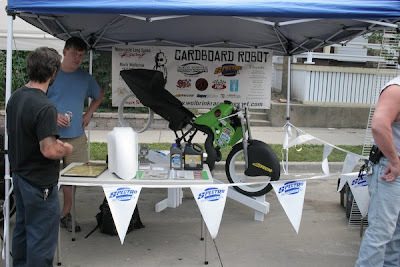 As a small group of freethinking motorcycle racers, we really appreciate the individualism and self-determination shown by the geeks and freaks that drive Cardboard Robot. Spectro Oils have been in every bike I have owned since my very first bike, an RD250 I got when I was fifteen. They offer a complete line of quality lubricants for motorcycles, snowmobiles and PWC’s. 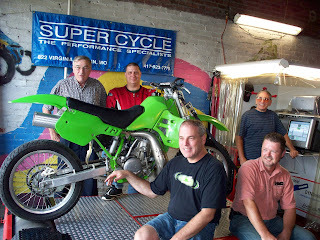 They are also great supporters of motorcycle racing, especially the Speed Trials by Bub. If you are considering a new Yamaha or Suzuki you can’t go wrong talking to one of the sales guys at Glenn Curtiss Motorsports. Whether it’s a new bike, an oil change on the 3rd of July or changing ice tires on a Saturday morning in February, the whole place is all about putting a grin on your mug! There are good tattoos and even great ones, but nothing compares to the art that walks out of the Adambomb Gallerie every day. Adam and Lane are simply the very best at what they do! 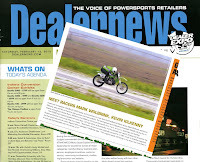 Scott and Jana at SuperMoto Racer Magazine are printing a magazine the internet will never match, let alone replace. Even if you are a pure, 100% road race or mx fan, you will love the photos and quality of SMR. Not only does AirTech offer bodywork for most eveything from 1958 to 2008, but they even dress their catalog models in period bikinis. Thanks to Pete, Kent, and everyone for the help. Street Graphix put together the fantastic banner behind the bike at Rockerbox. They really know how to make your stuff look fast! When you see a 70’s Japanese motorycle with clubman handlebars flying around Milwaukee, Scott J at Fuel Café and Tim Schneider at The Shop are directly to blame! They started RockerBox in 2002 and we still remain thankful today. It was great seeing everyone at Rockerbox, especially everybody that stopped by to see the bike. Sorry about being secretive, but the Speed Trials are nearly a month away. 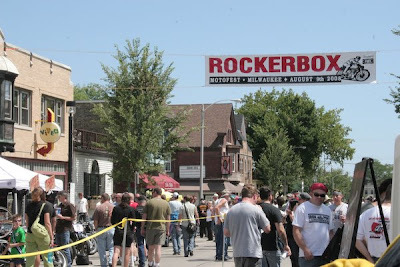 If you want to see the 2008 bike you are gonna have to come back to Rockerbox 2009!! Watch the action .... videos. Read the hype ... click here. Write to us ... click to email.